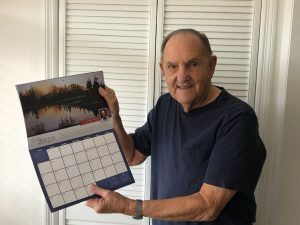 At age 86, artist, William Blumenstein, is featured in the 2019 Expressions Calendar for the month of July. The Expressions Calendar is an award winning calendar that celebrates active aging and the arts. His watercolor painting titled “Quiet Waters,” was selected from entries nationwide to be included in the full-color wall calendar.The Fountains at Lake Pointe Woods, a Watermark community, participates in the calendar “competition” that has been ongoing for more than 18 years. Residents from all over the community submit their artwork for a chance to be featured in the full-color calendar. Mr. Blumenstein started painting late in his career in 1987 and even put down his brushes at one time. He started painting again in 2007 to satisfy a need to create while receiving chemo. Bill has stayed with watercolor and his subject material and style has changed over time. He currently favors waterscapes but has also painted a variety of scenes. Look for Mr. Blumenstein’s art, alongside other beautiful pieces in the 2019 Expressions Calendar.